Rhythmic abilities vary widely in the general population, but little is known about the factors that give rise to this variability. Why is there such a huge range in our abilities to hear and reproduce rhythms? In this study we wanted to find out why some people can't accurately reproduce a short, simple rhythm (like this one), while others can reproduce long and complicated rhythms (like this one). One factor may be musical training. It would make sense that training with rhythms might make us better at reproducing them. Another factor may be differences in auditory short-term memory (STM) capacity (the amount of auditory information that can be remembered over a few seconds, like when you're trying to remember a phone number to write down). Finally, rhythms with temporal regularity (e.g., a beat) are generally easier for us to remember and reproduce, therefore it seems logical that people who are better at finding that beat will also generally be better at reproducing rhythm. If you can't feel the beat, then all rhythms might feel irregular and be difficult to remember, so we predicted that individual differences in sensitivity to the beat may also contribute to rhythmic ability differences. 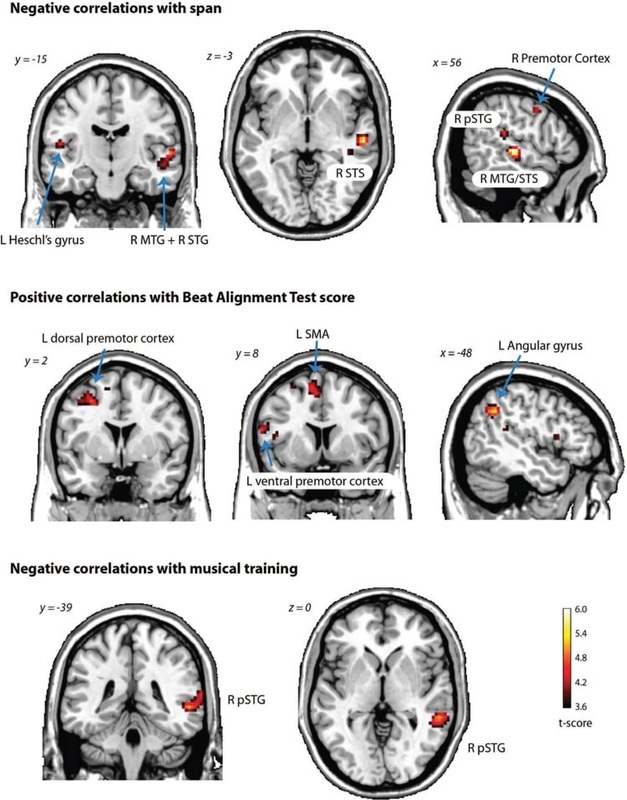 To investigate whether the above factors did play a role, we assessed auditory short-term memory (STM) capacity, using digit and pseudoword span tasks, beat sensitivity (using the Beat Alignment Test [BAT]), and levels of musical training. Forward digit span. Recordings of the digits 1 through 9 were used to create random digit strings of different lengths. The random digit strings consisted of two to nine digits, and a digit was never repeated within a single string. For all eight string lengths, two strings were created. Digit span was calculated as the longest digit string length for which the participant was able to accurately reproduce at least one of the two strings of that length. If you're interested in knowing your digit span, here is a site (free registration required) where you can take the test. Pseudoword span. This task was similar to the digit span task except that participants verbally reproduced strings of one-syllable pseudowords (e.g., nars, garm, chack). Pseudoword strings were two to four pseudowords long. Participants completed four trials of each string length. Pseudoword span was calculated as the longest word string for which the participant was able to accurately reproduce at least two of the four strings of that length. Beat alignment test. To measure beat sensitivity, we used part 3 of a test developed by Iversen and Patel (2008). Participants were required to decide whether beeps superimposed over a musical excerpt were in time with the perceptual beat of the excerpt. The BAT score was the proportion of correct responses across the three different conditions (beeps correctly aligned, phase error, tempo error). Rhythm reproduction task. To measure rhythmic ability, participants heard rhythms through headphones and had to reproduce the presented rhythm by tapping it back with a finger. People tried to reproduce 72 rhythms--12 short, 12 medium, and 12 long beat (regular) rhythms, in addition to their nonbeat (irregular) counterparts. The fMRI rhythm task used the same patterns and tempi as its behavioral counterpart, but omitted the long rhythms based on behavioral data, which suggested they were too difficult. A depiction of the contribution of each of the individual difference factors (beat sensitivity, auditory STM span, and musical training) to performance accuracy for beat rhythms. Higher numbers indicate that a factor made a stronger contribution to accuracy for that rhythm type. A line through the box means that factor did not contribute to accuracy for that type of rhythm. Brain areas showing significant correlations in activity with span, BAT score, and musical training. All the factors (short-term memory, beat sensitivity, and musical training) correlated with how well people were able to reproduce rhythms. BAT score (beat sensitivity) significantly predicted performance for all rhythm lengths. A weaker effect for shorter rhythms indicates that beat sensitivity may only be beneficial when the rhythms are long enough to tax STM. Span (short-term memory) predicted rhythmic performance, however, the effects were dependent on levels of musical training. For those without musical training, span significantly predicted performance for rhythms of all lengths. For those with musical training, span only predicted performance for longer rhythms. Musical training predicted performance for all rhythm lengths, and did so independently of span and BAT score (although it did correlate with both factors). This indicates that musical training does not enhance rhythmic ability solely through changes to auditory STM capacity or beat sensitivity. Left dorsal and ventral premotor cortex. Those with poorer short-term memory activated certain auditory areas more than those with better STM, perhaps because they relied on auditory imagination rather than 'subvocalization' (a motor strategy of mentally producing the rhythms). For example, to remember a phone number, an auditory strategy is to imagine hearing the person saying the numbers. A subvocalizing strategy to say the numbers silently in your head, over and over, until you can write them down. Finally, those with musical training had greater activity in the posterior MTG, and lower activity in two motor areas (left supplementary motor area and ventral premotor cortex). Posterior MTG is most strongly associated with accessing of semantic meaning, potentially acting as a sound-to-meaning interface. None of the rhythms, however, were taken from known identifiable pieces of music, and no musicians reported attempting to associate the rhythms with meaningful music as a strategy. Therefore, the meaning of this greater response in musicians is unclear. Rhythmic ability varies widely across individuals, but with a relatively continuous and uniform distribution, rather than a bimodal one, suggesting that deficits in rhythmic ability represent the tail of a continuum and not a separate, specific deficit. There are as many people who are fantastic at rhythm as there are who are terrible at it, with most of us residing in the middle. Consistent with the observation of a continuous distribution, multiple factors were found to predict rhythmic ability. In particular, auditory STM capacity, beat sensitivity, and musical training each accounted for unique portions of variability in rhythm reproduction performance, indicating that each factor made an independent contribution to rhythmic ability. Musical training predicted performance regardless of the length of the rhythm. Auditory STM capacity and beat sensitivity were important particularly when rhythms were longer. Finally, each factor was associated with alterations in auditory and motor brain activity during a rhythm discrimination task, further highlighting the importance of auditory–motor interactions for rhythm performance ability.